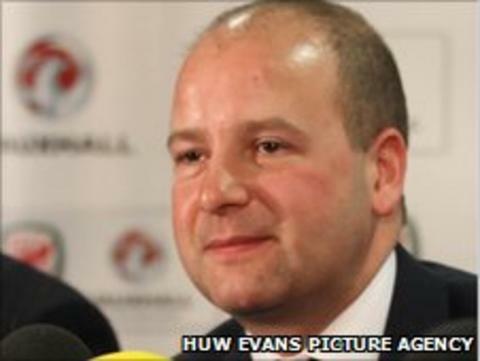 Chief executive Jonathan Ford has revealed the Football Association of Wales has come to an agreement with the Football Association over disciplinary matters involving Welsh clubs. Welsh clubs playing in England have been solely answerable to the FAW. But following talks with their English counterparts, Ford said a FAW representive will now sit on FA panels involving Welsh clubs. "It's got to be a level playing field," Ford told BBC Sport Wales. The six Welsh clubs playing in the English league system have previously been dealt with solely by the FAW. But many observers have said the clubs - including Cardiff and Swansea - should come under the umbrella of the Football Association. "This is an unusual situation where we've got exile clubs playing in the league and ultimately we needed to find a solution," Ford said. "We understand that ultimately, when clubs are playing in one particular competition, the jurisdiction around it should be the same. "Ultimately we have got some solutions here and ultimately there will be some control conceded to the FAW, but only done in a manner that we sit at the same table. "It will be joint powers and ultimately we will make sure the competition is as fair as it possibly can be. "We will still have FAW bods sitting at that table whenever a Welsh club is in front of them. We've taken time working with the Football Association to make sure that we get that balance right. "It's very important that we managed to get out of these discussions what we wanted and I'm pleased to say we did and ensures we keep a seat at that table. "But ultimately it was to ensure that there's a level playing field and that no, one club can turn around and accuse the Welsh clubs from being treated differently in the same competition."